Welcome to the latest episode of The Simply Smart Business Show. In this show, I’m joined by therapist and entrepreneur Rebecca Bass-Ching to delve deeper into the topic of mindset and mental health. 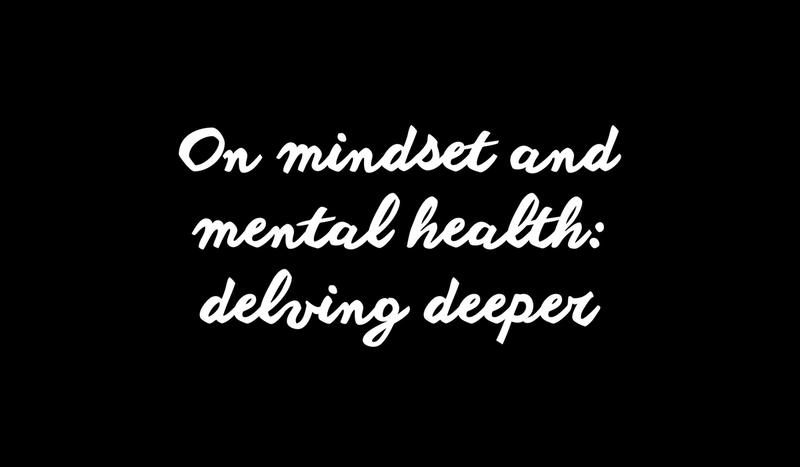 **This is a follow-on from last week’s episode, where I talked about the important distinction between mindset and mental health – give that one a listen here before diving into Part 2. Typically, whenever I publish a new episode of my podcast, I like to share a summary of the content here. This week, I feel moved to do something different. You see when we’re talking about mindset and mental health every word is important. Any conversation that draws attention to these topics is incredibly valuable… so how do I decide which words to edit out? This is the stuff that goes beyond me and my content strategy. It’s the stuff I want us all to think about and be aware of – whether some consider it controversial/taboo/a faux pas or not. So in this show, you will hear me question Rebecca’s response to my musings last week. You’ll hear her perspective as a licensed mental health clinician (and inhabitant of the woo world). You’ll hear about the many interpretations of mindset and mental health issues, and how these can be intrinsically linked (or not). Most importantly, you’ll hear two entrepreneurs standing up and talking about something that should be talked about, and not just behind closed doors.